Aaptiv is a great source for quick tips on all things fitness. See this piece Melis contributed to on The Power of Scheduling Your Workouts. Read full piece here. The Wall Street Journal's writer, Jen Murphy, conducted an interview with a deep water athlete. Read the full piece here. Make the most out of your cardio workouts by getting your facts straight. Readers Digest and Jenn Sinrich requested some thoughts from Melis, to a piece entitled "23 Lazy Ways to Burn More Calories Every Day". Read the full piece here. SparkPeople and Melissa Rudy wanted my thoughts on getting started in outdoor riding (or transitioning from indoor to outside riding). Read full piece here. Written by Julia Dellitt with contributions from Melis, read what common mistakes should be avoided when stepping onto a stair climber. See entire piece here. Aaptiv: 6 Tips from Runners for Getting Through Long Runs. This piece hits it again with some quick tips for getting through long runs.....Jenn Sinrich states "Long runs are tough, but they don’t have to feel impossible." Melis contributed with a few others on some easy tips a try." See full piece here. Aaptiv requested another bit on my thoughts in training/using a stair climber. From proper position to how to burn more calories.Read full piece here. Book Review by the Advocate: a short but spot on review. TRAIN: The Fat-Burning Water Workout. Can you get a great workout that is both strengthening and helps with weight loss? YES, do this workout in the February issue of TRAIN magazine and see for yourself! The 7 Signs You Need New Workout Shoes. Read the full piece here. Common Running Injuries (and Water Workouts to Try While You Heal). Many runners suffer from the same injuries. Read the entire piece here and learn what you can do in the water to work your way to healthy running form (or keep from getting injured). TRAIN and The Ultimate Cardio Water Workout. Sorry, not direct link to this piece; it is found in the March 2018 issue of TRAIN, page 25 & 26. Must have gear for Water Aerobics (& Deep Water training). Keep your eye out for other pieces to come written specifically for water aerobics, deep water running and more. Track this blog here. Once the book came out, PTPR contacted my co-author (Kat Wight) to write a specialty piece on deep water and more. A co-written piece diving into potential mysteries even to Physical Therapists. Read the entire piece! Want to know a few things to strengthen your posterior chain for your next race? Check this quick - but not easy workout - shared to the readers for Women's Running. Cooking Light: 12 Tips for Running in the Colder months. Jenny McCoy requested some top tips from experts in the field, and Melis provided a few suggestions. Hilary Topper writes the blog "A Triathletes Diary" and has a great book review for anyone on the fence to how the book was written; from the history to how to what you get out of it and more... check it out. 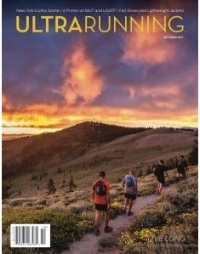 UltraRunning magazine's October issue presented a fantastic book review by Lisa Henson. TRAIN Magazines Editor-in-Chief, Ray Klerck, has requested regular water workouts by Melis. Get an online subscription and follow monthly! Health Guru and their piece on Deep End of the Pool Workouts. By Kristen Seymour interviewed Melis Edwards for the September edition of Triathlete Online. See full piece here. Guest Post on Michael Wood Fitness on the Zen of water training. Read the full post here. Shirley Archer Eichenberger, JD, MA wrote a new piece in American Fitness (summer 2017) on water training, with contributions from Melis. Find the full article here. Want a quick an easy workout, check out this guest post Melis wrote for Fit Bottomed Girls called "Not Your Mama's Water Workout."